Karen House was the former residence of Karen Blixen, author of the best-selling novel Out of Africa. The house was purchased as an estate comprising 6000 acres in 1917 by Bror and Karen Blixen and for some years was run as a coffee plantation. This was her home until a series of personal tragedies forced her to leave Kenya in 1931. This museum was originally the home of Karen Blixen, who came to Kenya from Denmark in the early part of this century; the present museum site is at the heart of the larger coffee plantation run by Blixen between 1914 and 1931. 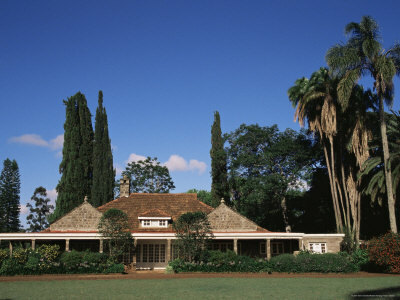 The house and surrounding land was donated by the Danish government to Kenya at independence; the house was restored by the Danish government and was used during the filming of Out of Africa, which immortalized Karen Blixen's book by the same name. The Museum was opened to the public in 1986. Airport transfer from Nairobi Jomo Kenyatta International airport or Wilson airport to Karen Blixen Museum or trasfer from Karen Blixen Museum to Nairobi Jomo Kenyatta International airport or Wilson airport.